I'm home, I'm home. Plans to work on the plane were mostly scuppered by it being a very old plane of the kind that didn't have power outlets on it, and a very old laptop with very old batteries. I also got to experience the madness that is travelling through a UK airport first hand ("take everything out of your pockets and put them in this plastic bag" ) and my not-really surprise that you can buy everything you would need to hurt people on a plane on the other side of the barrier. Got up blearily this morning to discover a kitchen table covered with stuff waiting for me, said stuff including Kitty Medicine for Fred the Cat (who is not just Unlucky, but is being made Very Irritable by the medicine), and, slightly more excitingly, a box from DC Comics with an advance copy of Volume 1 of the Absolute Sandman. It comes in a box. It's huge. It's heavy. 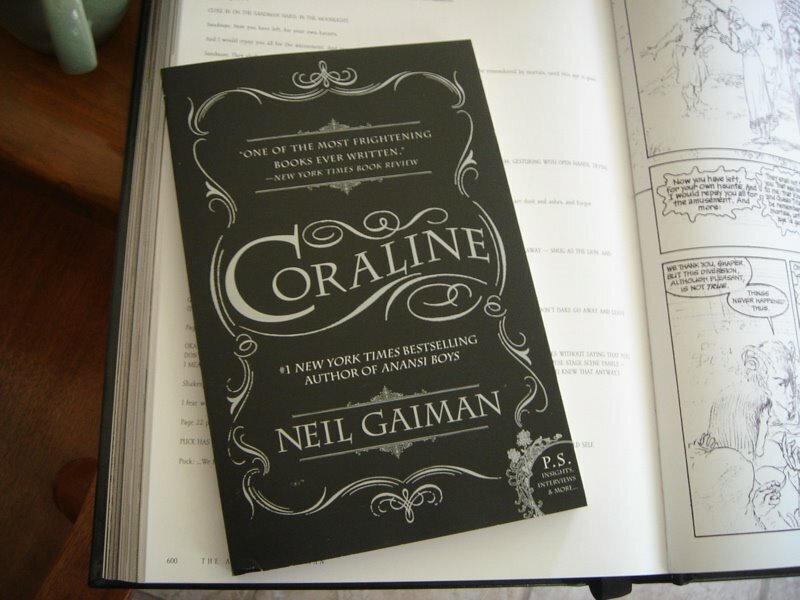 It's over 600 pages long. 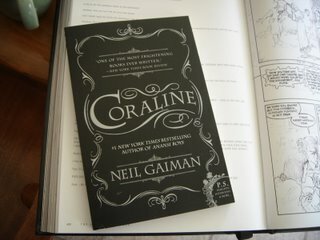 It weighs enough to cure me of any desire to have a Complete In One Volume Sandman. 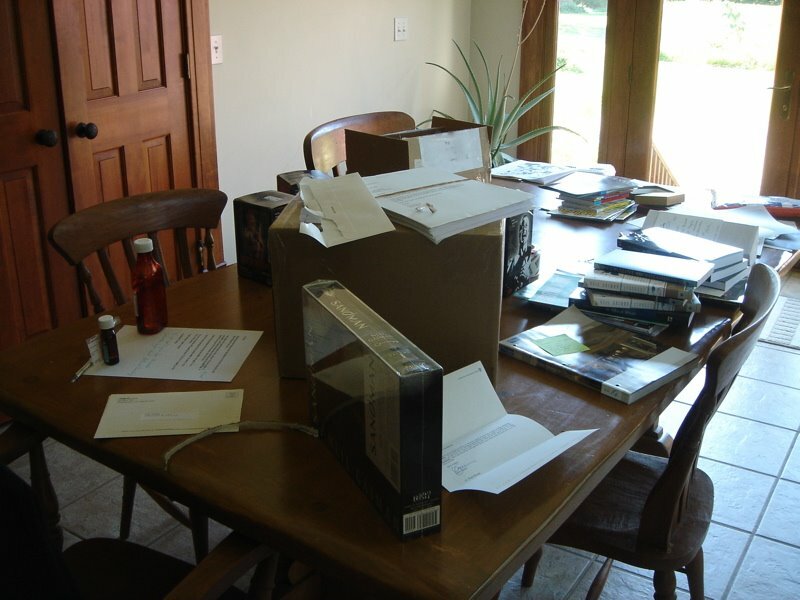 A Kitchen Table. With Stuff On It. Also on the kitchen table, and I would not want these things to be overshadowed, were the nice trade paperback edition of Stardust (which reprints "Wall, A prologue" from A Fall of Stardust), the elegantly creepy all-type-cover adult edition of Coraline (with Dave's illustrations on creepy grey paper), a Portuguese copy of Anansi Boys, and the upcoming Bloomsbury edition of Mr Punch, which will finally be back in print in the UK. 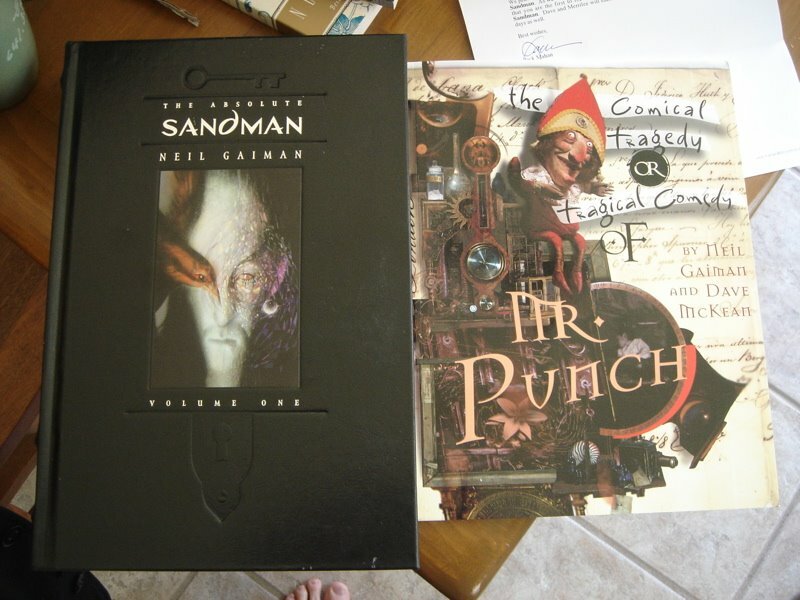 If you remember how big Mr Punch is, the Absolute Sandman is bigger. Also on the table were the covers for Fragile Things, and the third issue of Eternals. And contracts, things to proofread, letters and stuff. mostly stuff. Look. One of these books is big. The other is bigger. 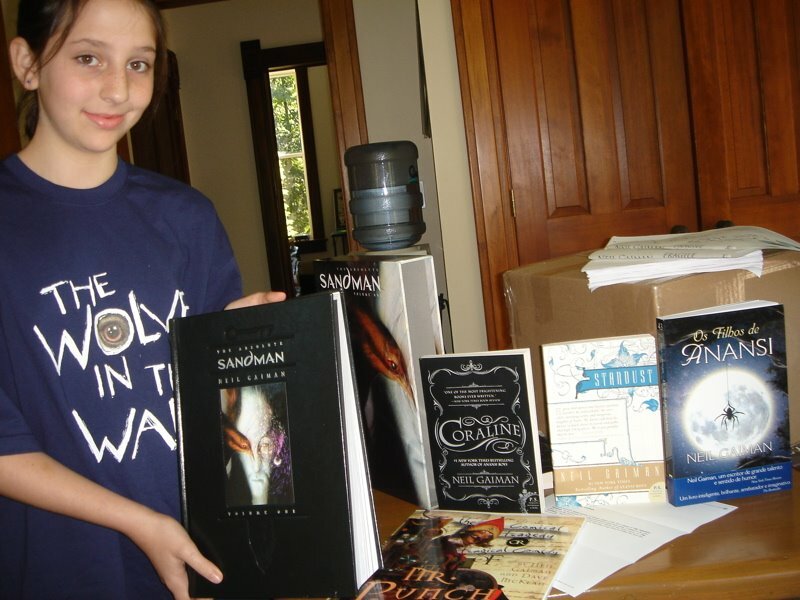 Miss Maddy consented to model books for me (when I decided that you still couldn't see how big the book was) despite wearing her Wolves in the Walls t-shirt that is really pyjamas. The facial expression is "Dad, you're weird, but I'm happy you're back." Okay dad. I'm holding the book. Now what? Open? you want me to hold it open? And here's the Coraline, sitting on the Absolute Sandman (you can see some script and Charles Vess's pencils for Sandman 19). 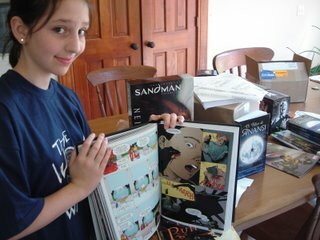 and from it I learned that Dave Sim is doing a webcomic -- at http://www.urge2film.com/index.php?go=12. Right. Back to work.